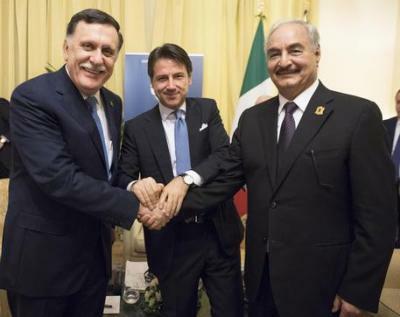 ROME - A bilateral meeting arranged between Conte, Haftar and Libyan prime minister Fayez Al-Sarraj on Tuesday morning reportedly ended amicably, as leaders shook hands before going their separate ways. The Italian prime minister convened the meeting as Khalifa Haftar, head of the Libyan National Army, refused to participate in a Palermo summit, called to put an end to conflict in Libya, which opened on Monday. Haftar controls a large part of eastern Libya, while Al-Serraj’s government is based in the west of the country. The meeting was the first between the two rival leaders since May. Upon his arrival in Palermo on Monday evening, Haftar refused to have dinner with the other participants at the conference, many of whom he considers extremist. A representative for the Libyan National Army tweeted, “General Commander Marshal Haftar arrived in Italy yesterday (Monday) in order to hold a series of meetings with the heads of neighbouring countries. He is not there to attend Palermo conference.” Prior to the summit, Haftar had openly opposed the attendance of Qatar. UN Secretary General António Guterres was in attendance, as well as the EU’s foreign policy chief Frederica Mogherini, Egypt’s President Abdel Fatah al-Sisi and Russian Prime Minister, Dmitry Medvedev. During the summit, Libyan elections that had been set to take place in December were rescheduled. The UN special envoy for Libya, Ghassan Salamé, said the vote would be held between late March and late June instead. He said the format would depend on the result of a national conference scheduled to take place early on in 2019. He insisted this conference take place on Libyan soil. Salamé criticized members of the house of representatives, politically aligned with Haftar, for being “time-wasting” and “sterile”, much to their disgust. Meetings focusing on economics, sectarian and security issues were also held on Monday. The Italian government are allegedly hosting the conference to regain diplomatic responsibility for Libya, following a previous French-convened conference. It has been widely reported that Conte was extremely disappointed by Macon’s decision to convene a summit in Paris in May. Italy had been distracted at the time by the formation of a coalition government, but is usually a dominant player in Libyan diplomacy. Politicians maintained that the French government was trying to support Khalifa Haftar in the Libyan east, rather than the government in Tripoli. In response to criticisms, France claimed that UN attempts to create peace were proving unsuccessful, and a new initiative was needed to unite everyone.